Publisher: Meisha Merlin Books, New York, NY, U.S.A.
Assistant Trader Jethri Gobelyn was an honest, hardworking young man who knew a lot about living onboard his family's space-going trade ship; something about trade, finance, and risk-taking; and a little bit about Liadens. It was, oddly enough, the little bit he knew about Liadens that seemed like it might be enough to make his family's fortune, and his own, too. In short order, however, Jethri Gobelyn was about to find out a lot more about Liadens... like how far they might go to protect their name and reputation. Like the myriad of things one might say-intentionally or not-with a single bow. Like what it would take to make a Liaden trade-ship crew trash a bar. Like how hard it is to say "I'm sorry!" in Liaden. Pretty soon it was clear that as little as he knew about Liadens, he knew far less about himself. With his very existence a threat to the balance of trade, Jethri Gobelyn needed to learn fast, or else help destroy all he held dear. 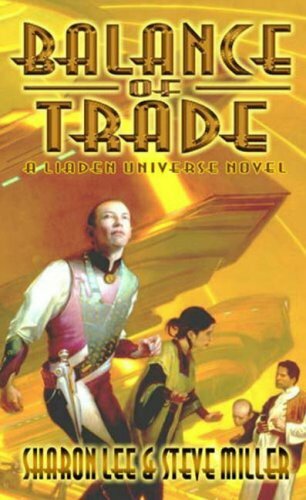 This stand-alone novel in the Liaden Universe® is a story from the early days of trade between Terrans and Liadens.